Banjo Brothers is all about making simple and affordable bags for all your cycling needs. 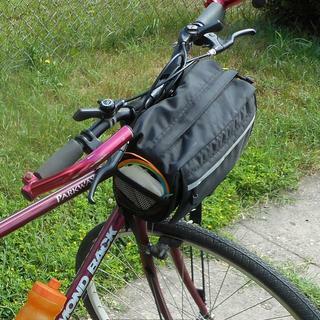 The Handlebar Bag comes in two sizes, both of which are large enough to carry your cell phone, nutritional bars, and your keys. Made of heavy duty canvas with reflective accents, the Banjo Bros. Handlebar Bag is the perfect way to keep your essentials handy while commuting into work or just riding around. 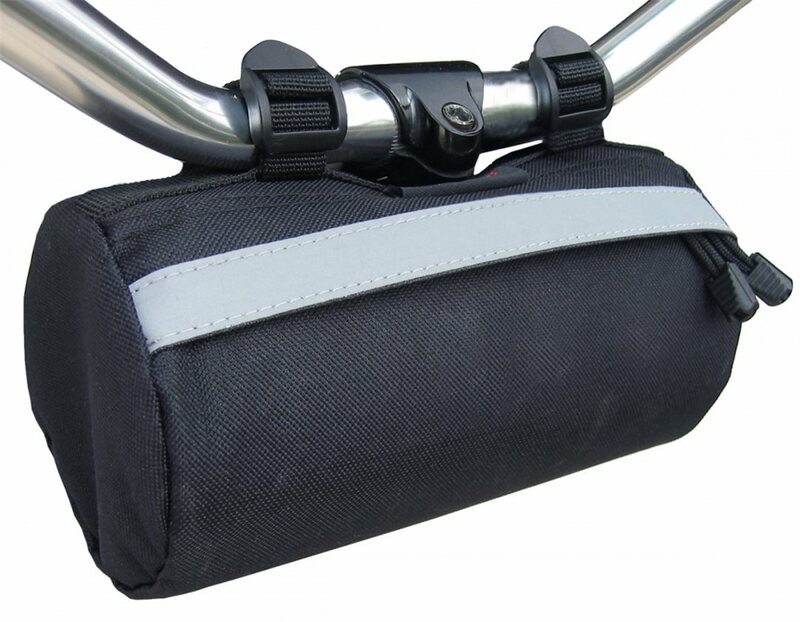 Thanks to the waterproof fabric and overall design, and despite the unsealed seams, the Handlebar Bag is surprisingly water resistant. Granted, if you happen to be riding through a rain storm there will be a few leaks, but for everyday commuting with an occasional light drizzle, the contents of the bag should remain dry. The 7 lbs (3.1kg) carrying capacity allows you to empty your pockets and store everything you need in this neat little bag. I've used both of these bags and I must say they offer amazing value for the dollar. The large bag has TONS of space. I used it on a 100mi dirt century and it worked great on my drop bar bike, albeit with one flaw: it's too heavy to support itself, so it rotates to hang downward instead of straight out. So, I used a garmin mount turned downwards and zip tied the whole thing to it to hold it in place, and that worked great, although it was a little clunky. The extra storage space allows you to get everything off your back. You can put two tubes on either side, and a ridiculous amount of food or clothes inside the main compartment. I put 8 big protein bars as well as a bag of trail mix inside, and when the day started to warm up, I put my jacket inside after eating some of the bars, so it worked out nicely. For epic rides where you're carring 4 tubes or more, it's nice to have the pockets on the side for extra tubes and tools. The small size bag I found really useful for holding food during long rides. It's nice to be able to grab food directly from it while riding, as opposed to having it in your back pockets or in a saddle bag. I managed to stuff a quart-sized bag of trail mix along with 10 honey stinger waffles inside it, and the waffles were great because the opening is hardly big enough to fit anything but a small, thin thing like a waffle through it. You won't actually be able to carry a burrito in this burrito-shaped bag, simply because the opening isn't very wide. However it would be great for carrying extra tubes, food, or a windbreaker along with other stuff. It's nice that it has a plastic insert to give it some structure, although this might cause rattling if you put hard things inside it. It's the perfect size to fit between drop bars or on MTB bars, and it doesn't swing or make a bunch of noise. In the end, I actually prefer the small bag over the large bag. For the price, you can't really go wrong with either. I've been using my medium bag for a year and a half now and am quite pleased with it. For one, I open and close the main bag's zippers quite a bit because I'm fishing my camera out all the time, and they have given me zero problems. Also, I've ridden in the rain at least half a dozen times-- an hour or more each time-- and my stuff isn't getting wet. My medium bag, over a year old. We love the Banjo Brothers handlebar bags. My wife likes the compactness of the smaller bag on her 2014 Giant & l appreciate the versatility of the larger bag on my 1997 Specialized with it's extra pocket & map window. They're both water resistant and look great! 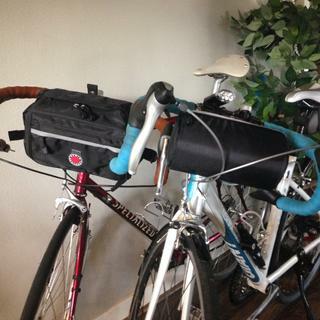 My wife & I use both sizes of the Banjo Brothers handlebar bags. They're great! Installs easily, nice size, well made. I would choose something else for adventure or touring bike but works great on my daily commuter. Shift and brake cables need to be tucked up tight to bars or this bag will not fit well. Bought one for myself and a friend. 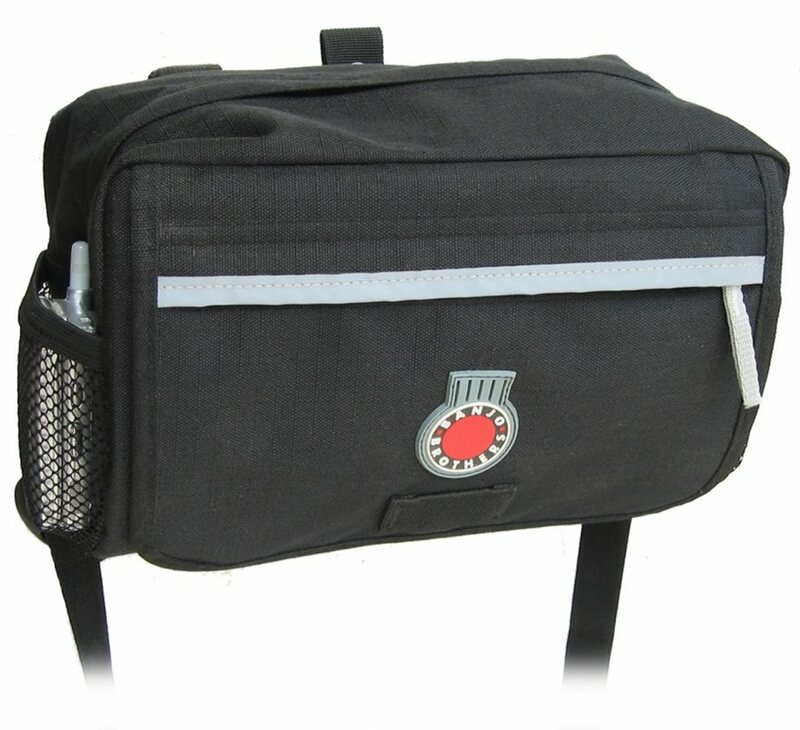 Does the medium Banjo Brothers handlebar bag have any insulation value or is it just canvas with no padded liner? I'd like to use it for my lunch while commuting each day. Thanks! BEST ANSWER: No. It has an outer layer of black synthetic fabric (not canvas) and an inner liner of thinner red synthetic fabric. In between is a hard but flexible plastic "card" that's bent in a U-shape to give shape and some rigidity to the bag (rounded on the bottom). If I wanted insulation in this, I might buy some duct insulation at the hardware store, cut it to shape and line the interior. Considering the two layers, you could possibly insert the insulation between them, though you'd need to cut the inner liner to do so. Bought the small bag, it has a plastic liner , no insulation. It does not have a padded/insulated liner.